Unlock your Consciousness and unfold the full potential of your awareness! Start understanding how thought functions and how to shape your Self within the reality around you. Master the innate nature of your Spirit. Have you ever wondered why you think in a specific way? Why you end up constantly stuck in pointless loops of negative thought? Or perhaps why everything seems so hopeless while others around you are not bound by such thinking? Break free by understanding how to defeat these patterns and vanquish the Mind Thief, unlocking the actual power of thought and manipulating it to your advantage in all you do! Your memories hold phenomenal resources of which you can take advantage. Learn how to make practical use of them for both empowerment and healing. Rid yourself of memories which hinder you in life and use them instead to your advantage through mastery of the Minni. Discover how the runes will help you to reclaim your energies and enhance your awareness through runic trance dancing. Learn the proper methods for visualisation and master the actual power of intent and pure thought, the keys to shaping reality through your Will, and realise the hidden potential of the Norse ‘Holy Grail’. 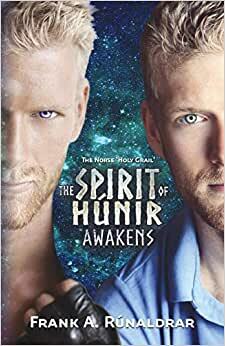 I’ve read this author’s first book and thought it was great so decided to invest in this one The Spirit of Hunir Awakens (Part 1): Norse Keys to the Spirit, Mind and Perception (High Galdr) and the part 2 one. We have all read about the mind, spirit and consciousness but good god this author takes all that and takes it to a whole new level. All the things I have come across other books are left in the dust in comparison. When the publisher says that “we are entering the domain of expertise of the author” they are not kidding. At page 9 he goes on to describe not only what spirit is but also how it was created in the first place, no where have I ever seen this and the best? It actually makes perfect sense. The meditations of becoming runes is simply, wow. Then later on I read his explanations of how thoughts work and how thinking comes about, how this hugr part of us serves to bring not only logic but also ideas and concepts to you and how to enhance it all. The chapters on perceptions and how we all perceive differently making different understanding and concepts possible I found fascinating, the different ways of thinking in between men and women is something I have never thought of but it makes a lot of sense. He then goes on into language and how it is not only used to communicate but how it limits the mind. Who would have thought? In the second book which I think it a lot more practical, but I see why it is because without all the groundwork in the first you will struggle with the second. But here you discover how thought manifests into realities and I think the most exciting part of it all is you find out how to use this to your advantage. Then the big things are dealt with. From the first time I have read about intent it always confused me, no matter how hard I looked I could not find any explanation of what it actually was or how it works. Well here I found not only what it is but also how to use it and increase its effects. The same happened with visualisations I had no idea that depending on how you visualise your mind can simply not do anything with it all or make it manifest? Dam. Tried that little trick and bam things started working left and right which no matter how hard I had work on would simply not work. But the best part was with what the author refers to as the odrerir. I actually did find all sorts of references to it in the Eddas, but he brings it all together and cuts through all the chase to not only show you how to use it but to develop that too. Who would have thought that this holy grail thing started off in Norse myths. Most sources just describe it as a cauldron but here I found what this all referrers to and how to use it, does it work? Bloody well it does, shame the book stops at just teaching how to use it to get into rune trances, wish it went further. This must have more uses as hinted in the Eddas here and there. Having said all this I do with they would not include all the definitions, about the norse tradition and intro to Galdr in each book. Seems a bit repetitive for those of us who have more than one of the author’s books.